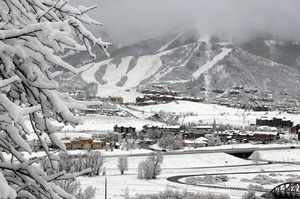 Is it snowing in Steamboat ?Thank you! 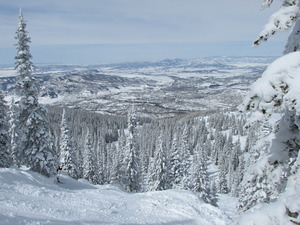 Steamboat is where Olympian Billy Kidd hangs out and, when he's in town, you (and many of your new found friends) can ski with him every day. This is the 'Wild West' and the atmosphere in the village and on the slopes reflects it. Yes, you can wear your cowboy hat when you ski. Be sure there's a strap under it. 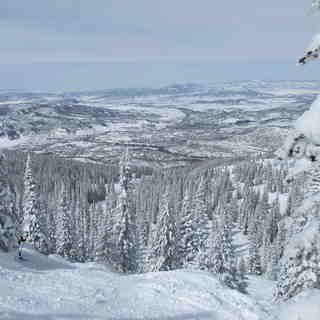 The town at Steamboat is as much fun as the mountain too. Hotels, condominiums, and townhouses are available at the base and nearby town. Camper facilities are located in town, with utilities and convenience stores. 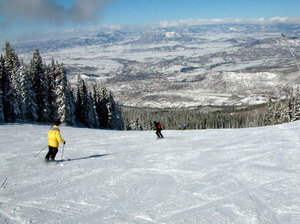 Other nearby facilities at Steamboat are Ski Time and Fish Creek campgrounds within 5 miles of the ski resort. I met a lady in a knee brace where I work. I asked her how she hurt her knee. She said she was in a beginner class. (3 men, 2 women). She felt she was rushed up the Christie lift and told she needed to be able to stop. She was terrified and the other lady was crying! She eventually fell and injured her knee. The instructor left her there! She finally had to flag someone down so they could show her how to remove her skis!! She spent the rest of her trip in the condo with ice! I encouraged her to return and take a private lesson with an experienced instructor.